I have a 5 1/2 year old male Bichon Frise that about two years ago lost his house training and started peeing in the house. I had him thoroughly checked for various things at the vet and all possible things were ruled out. My feeling is it is his way of showing he is unhappy when we leave. He is now peeing in other places. If he is caught in the act he is sprayed with a water bottle and given a time out in his crate. He is treated like royalty-sleeps on the bed etc. just so you don’t think he is neglected, actually just the opposite! I’m not getting why you think he’s “acting out” because “he is unhappy when we leave” as you’re indicating it happens when you’re home as well. It’s possible that his house training missteps are anxiety related if the incidents when you’re home coincide with some sort of stressful occurrence. However, it’s also possible this is connected to his being treated like royalty rather than a dog. I know there are dog trainers that think a “time-out” in a crate is more humane then actually saying, “No!” in a manner meaningful to the dog. I’m not one of them. In nature, a “time-out” is something a mother dog, wolf, ape, gazelle etc. might do to her young if she wants something to eat them. It just isn’t used as an “educational” tool. I’m not saying that time alone is not something that a dog might perceive as a discipline but it’s an unnecessary workaround and makes it harder for a dog to connect the dots. In the animal kingdom, if discipline is required, it happens on the spot in a clear and fair manner. A timeout would risk a return to find nothing left but blood, bones and fur so I’m pretty sure it’s not the best way to help a dog connect the dots. Contrary to the more politically correct, but I think sadly misguided dog trainers, discipline and abuse is not the same thing. Just because they can’t see the dog when it feels bad doesn’t mean that’s more humane then addressing the behaviour in an immediate manner. The water bottle is another piece of new-wave bizarreness. It’s another illogical connection using weak science to define what a humane “correction” is. Some dog trainers think that making a dog feel bad about something by spraying water at it is more humane than a well-timed fair verbal correction. The truth is that both are useless if the dog isn’t making the right connection. Depending on the timing and perceptiveness of the person holding the water bottle I’ve seen more than one dog just think that water bottles are horrible. One might say that’s better than the dog thinking their human is horrible but I don’t agree that is even possible in a normal human/dog relationship. We’re all wired well enough to cope with fair discipline provided by the teachers in our lives and the overall time a dog spends with its human companion is by far counterbalanced with love which keeps the discipline component in context. I am so absolutely fed up with my 2 10 yr old Bichons. They used to be housebroken and now they literally cannot be trusted at all inside house. They will pee or poop anywhere, especially on rugs. They will go in the crate also. I will NEVER get another bichon…I don’t want to resort to potty pads but I cannot have them ruin my house any more. They are fine health wise. I just can’t take it anymore. I understand your frustration. No need to ever get another Bichon but this isn’t a reason as the problem you are having isn’t a known breed trait. When you say “used to be housebroken”, how long ago was that? The two main reasons that a dog (rarely two at the same time) loses it house training when it has been good all its life is either health related or anxiety triggered (changes in routine, household structure – or possibly health). Another reason is dementia but they don’t seem old enough for that. How sure are you that they are healthy? Did your vet do a complete blood panel? Have they ever had episodes like this in the past that they recovered from? Also a bichon issue: got a 3 year old as a therapy dog for our son. She’s great at that, but never tells us when she needs to pee. Just does it! Usually in the dining room. Will also poop in the middle of the night if not crated. It’s possible you don’t have a dog with a house soiling problem. House soiling can be a symptom of anxiety (or poor health). If not, I would recommend reading my house training booklet. Please send Housetraining cheat sheet. i, too, have a 4 year old Bichon rescue who is basically house trained but will randomly pee in house, especially when it rains or in days after. Is the training the same as for a puppy? I’ve sent the housetraining cheat sheet as well as a new progress chart tracker that I recently made up. Could I possibly get a guide sheet to? I have a seven month old Bischon I take him out at least 3 times a day n he still goes in the house…. Check your email. I’ve sent you the information you asked for. like you fund each piece of created content. We’re at the end of our rope with our 6 year old bichon. She’s started to pee on rugs in the house. Vet has done a full battery of tests and found nothing wrong. We give a stern correction when we catch her in the act but she’s very sneaky. Help! If she hasn’t a history of this and by nature she’s not a nervous natured dog I still wouldn’t write off that there’s something potentially going on physically regardless of the tests. What was she tested for? Urinary tract and related infections? Blood work, ear problems, tooth problem, X-rays, eyesight issues, blood panel? Otherwise has something occurred recently in her or your household that has upset the equilibrium? Either way this sort of soiling is a message. I call it p-mail. If it’s not due to a physical or routine upset then some information is missing. If it were a straight housetraining problem I’d suggest start by having her drag her leash around and supervise her like a 2 year old for the next 6 months. When you might be distracted by something enough that leash or not you can’t interrupt her sneaking away, use her crate like a playpen. Put her in it but – near you – not isolated. Download my house training cheat sheet and follow those instructions as well. Would also love the cheat sheet. My dog has been doing the same thing the past month. Absolutely. Check your email it should be there shortly as an attachment. Check your junk/spam filter if you don’t find it in your inbox. We are struggling with our Bichon too. I love Billy, but we just figured out he has been peeing on one rug in our home. We got rid of it and put his nose in it and crated him. He does not get it. I am hoping for any help. We love him, but this is a problem. He is such a love and we take him out 3 times a day with walks. Help! There’s not enough information for me to provide targeted input. A dog’s history, age etc. can help put things in a context that gives direction. I’m going to send by email my house training cheat sheet and a progress chart to help keep you on track but if this is an anxiety problem or there is an underlining health issue you might be putting the cart before the horse and get further discouraged. FWIW, the putting the dog’s nose in it concept must have worked on some dog some time for such an idea to continue in circulation but it can back fire. Have a look at the cheat sheet and get back to me if you have questions. Check your email. (junk/spam folders too if not in your inbox in the next few minutes. Thank you! Billy will be 4 years old next week and we are not sure how long he has been peeing inside. Thank you so much. I am going to call the vet about a urinary track infection. He does have some anxiety. He really is the best. I wondered about the urinary tract infection but they typically aren’t targeting a single area when that’s the case. Definitely have it checked though. If he does it more so when you’re not home, rather then when you are, it’s more likely to be anxiety based. Has he ever soiled in his crate? Thank you! Never any accidents in his crate, but he paws the crate and bloodies his paws in the crate. I do not like to put him in the crate. I am going to try a bigger crate and ask our vet. Thanks again! I’ve sent by email “John Wade’s House Training Cheat Sheet” and a chart you can use to track progress. Check your spam or junk folders if not in your inbox. Hi can i have the cheat sheet too please? Is it possible that when dogs bark they have to pee and poop and the owners are missing the signals? Anything is possible but in these cases I don’t think it’s probable. For what it’s worth I have never believed methods that involve a dog signaling through barking or bell ringing etc. is wise. Instead it’s better to train them to go out on a schedule (as outlined in my “John Wade’s House Training Cheat Sheet”). What about the going in circles and going to the door signals that people miss? And people that clean spots with ammonia smelling products that smell like pee to the dog? Rubbing a puppy’s nose in it and spanking them is like spanking a baby for pooping it’s diaper. Keep in mind this is the basic approach for getting a pup on track for learning where they should eliminate, to do so 3 times a day on a schedule and to do so in a small area so you aren’t cleaning up “landmines” all over the yard. 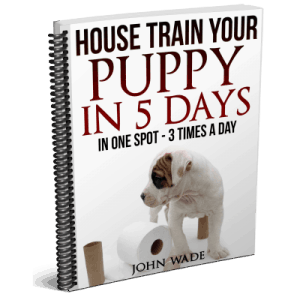 If you want something more detailed then the cheat sheet and especially if you are having a long standing problem I’d recommend buying my more detailed e-booklet – http://store.askthedogguy.com/how-to-housetrain-a-puppy-in-5-days-or-less-by-john-wade/ The e-booklet is only $4.97. I have just rescued an adorable Bichon, and I realise his peeing in the house is due to the change in circumstances at the moment. I think your cheat sheet would help me help him! May I have a copy please? Thank you. Please send the House Training Cheat Sheet. My 16 mo old Bichon pees twice in 15 minutes outside, and then within 30 minutes of being back in the house she pees on the floor, rug or carpet. a friend wants to give us his 13 month old bischon. He has been kept outside since the owner became frustrated trying to housebreak hIm. the dog has been checked out by a vet n has no health issues. If you have a question, it didn’t make it before you hit send. Hi! I too have a Bichon Frise and we are beside ourselves and regularly wanting to kill him for the constant urinating on anything. He will urinate on a rug or doona hanging on the side of my child’s bed while I’m standing there. He barks continually if I put him outside or in his crate. I am continually disciplining the dog who will soon be 11 months old. My husband is at the point of giving him away. Please help! I will send to your email address however if the dog is 10 years of age and this is a recent development I’d suggest a veterinarian visit for a complete physical. The obvious areas would be urinary tract etc type issues but blood work, X-rays, dental check, eyes, hearing etc would be in order as a dog can start sending p-mail when things are not as they should be. That can include upheaval as perceived by the dog in day to day environment and routines if the dog has historically been thought of as a sensitive nature dog. I’ve sent to the email address you provided the house training cheat sheet and a chart to track progress. Check your spam/junk filter if not found in your inbox. Our 7 year old Bichon is staining our house. She pees on everything, including her beds. She pees when we’re home, she pees when we’re gone. Just took her in and her urine is clear (she’s had crystals and is on a de-acidfyer and presc. food). This isn’t a new behavior. We’d have to kennel her 24/7 to stop the peeing. Any advice? Is this common for Bichons? Cheat Sheet is on its way by email. Check your spam/junk filter if you don’t find anything in your inbox. Sending to your email. Check spam/junk folders if not in inbox. Sure thing. Check your email. If not in your inbox, check spam/junk folders. I’m sending cheat sheet and a progress chart. By the time your pup is 16 weeks you should find 3 times a day and single spot in the yard. May I get a tip sheet also? May I get a tip sheet also? We have a 9 week old goldendoodle that I’m trying to train to use a patch of sod on our apartment balcony just until he has gotten all his shots. He pees on the sod patch wonderfully and quickly but will not poop on it!!! It has been sent. If not in your inbox, check junk/spam folders. Please send me a copy of your cheat sheet my mom is about to give her 2 bichion frisée away because of peeing in the house, they are 2 years old and were house broken. Thanks! I’ll send shortly. Check your junk/spam filter if nothing in your inbox. The cheat sheet will help get things back on track but I suspect only if you address what triggered two previously house trained two-year-old dogs to start soiling. I’ll send a guide to finding appropriate training as well as I think you may need some additional help. Could I please get the dog house training cheat sheet? •	Move from several times a day to three times a day on a schedule and to do so in a small area so you aren’t cleaning up “landmines” all over the yard. My 19 month old bichon was trained,but pee twice all of a sudden. I am checking with vet tomorrow. Sent. Check your junk or spam folders if not in your inbox.